Week seven of Arena Lacrosse League action saw the defending champion Whitby Steelhawks finally get their first win of the season, a close 11-9 triumph over the Paris RiverWolves. Whitby and Paris played each other closely until the third quarter when Whitby found a spark for a four-goal run. With Whitby up 10-8, Spencer Pyke scored with 3:05 left in the game to make it a one-goal game. Cam Milligan’s first goal back with Whitby after a stint with the Rochester Knighthawks was the insurance marker with 2:30 left to play. Milligan was recently cut by the Knighthawks despite putting up a goal and two assists with the NLL club, but his skill will certainly help out the last-place Steelhawks. He also added three assists. Luke Pilcher was Whitby’s star of the game with five goals and an assist. Assistant coach Chad Culp dressed for the game and pitched in a goal and three helpers. Paris was led by Pyke’s eight points (3G/5A). The Timbermen suffered their second loss in three games after starting the season on a three-game win streak. The Timbermen never led in this game, falling behind 3-0 early. 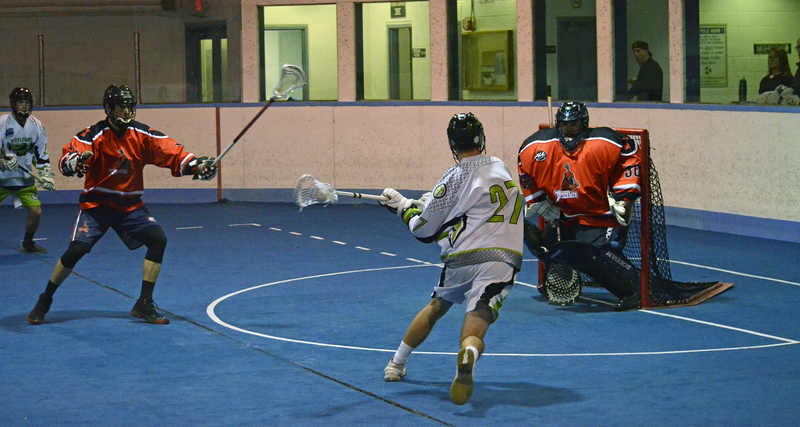 They were able to tie the game twice but the Outlaws always rebounded with two or three goals. Peterborough was done in by penalties, but Oshawa took a five-minute goalie interference late in the game but a strong penalty kill allowed them to keep the lead. Peterborough was led by Aaron Woods’ three goals and five assists. Doug Utting scored two shorthanded goals. John St. John led Oshawa with four goals and an assist while captain Mike Triolo scored three times and three assists. Rance Vigneux got the win in goal. The ShockWave continued their winning ways with an 11-4 takedown of the Toronto Monarchs at the Toronto Rock Athletic Centre. The ShockWave dominated every aspect of the game. The defence and goaltender Chase Martin were incredible, holding the Monarchs to just one goal per quarter. Josh Becker led St. Catharines with four goals and four assists. Bryan Neufeld and Anthony Patterson each had a pair of goals and four assists. Former Buffalo Bandit Bill O’Brien suited up for the Shockwave for the first time this season on defense. Jordan Dance had a pair of goals and one assist for Toronto, who remain tied for second place with Peterborough and Oshawa behind St. Catharines. Unfortunately, Whitby was unable to ride their momentum into a second consecutive win as they fell to the Six Nations Snipers. As they did against Paris, they kept the game close but always trailed. Dylan Hutchison’s shorthanded marker ended a five-goal run for Whitby that tied the game at nine in the second but Wayne VanEvery put the Snipers back on top just a minute later. Milligan led the Steelhawks with a pair of goals and six assists. Garrett Eddy had a hat trick and one assist. Bailey Brown and Lukas Coote split time in the loss. Wes Whitlow was on fire for the Snipers with four goals and two assists, while Van Every’s two goals and four assists also made an impact. Dustin Hill was the winning goalie.